Harley Davidson (H-D), the American motorcycle manufacturer has a loyal brand following not only in the U.S. but also in many countries across the globe. The motorcycle’s distinctive design and exhaust note has given rise to many loyal brand communities that are active in clubs, events, and even a museum. Such is the power of the cult iconic brand that just licensing of the Harley-Davidson logo amounts to approx. 5% of the company’s net revenues. In 2007, an Interbrand report suggested that the brand name ‘Harley-Davidson’ had a market value of $7.72 billion, which was 131 times more than the book value of $59 million. In 1983, the Harley Owners Group (HOG) was formed to capitalize on the brand following and create long-term relationships with the customers. The aim was to promote a lifestyle along with the product. By 2010, HOG became one of the largest owners groups in the world. Globally, it had about 1.4 million members with about 40 bike models. Harley Davidson bikes were called “Hogs” and in 2006, even its ticker symbol ‘HDI’ was changed to ‘HOG’ on the New York Stock Exchange. The company’s attempt to trademark the name however failed as it became a common term for heavyweight motorcycles. Freedom – Go wherever you want to, whenever you want to. Authenticity – Noted for the tradition of heavy customization, Oldest and quality name in manufacturing bikes. Community Building– HOG has 1.4 million members, Ride Planner to plan trips, H-D Photo Center for posting photos of memorable trips. Rituals – Community festivals and monthly or annual rides/events are conducted regularly, buttons and pins from an activity/event are worn on jackets. Masculinity – Unique sound of the exhaust, association with icons in films. Toughness – Rugged heavy design and look of the bikes. In the 1990s, everyone wanted custom Harley bikes. It had become the symbol of a generation of achievers and acquired cult status. A Harley bike meant toughness, masculinity, freedom and raw power (low-end torque) though it did not come with the latest technology or high speed. The company’s stock prices soared. Harley bike owners even had logo or bike tattoos done. Owners of H-D bikes did not just buy a product. They bought a whole set of shared values, a lifestyle, a heritage. The company wanted to capitalize on the brand. It introduced a range of accessories to match the bike. A chain of retail shops sold H-D branded merchandise like T-shirts, jackets, caps, gloves, helmets key chains, socks, ornaments etc. While motorbike apparel (Motorclothes® merchandise) and ornaments probably matched the Harley Davidson cult heritage brand, the company had lost focus. In the 1990s, it extended the brand too far. It introduced products like wine coolers, aftershave and perfumes. Even the loyal fans did not like the idea, as it did not resonate with the tough brand identity. The company was clearly not focusing on what it knew best – building strong bikes. Customers wanted strong bikes and accessories that complimented the brand, but ties and infant clothes went too far. Activities like cruise biking were good initiatives by the company to involve the customer and enhance brand loyalty. However, Perfumes and wine coolers were eroding the mystery of the H-D brand. After strong criticism from the loyal customers, the company pulled of many inappropriate products. H-D had learnt a branding lesson. 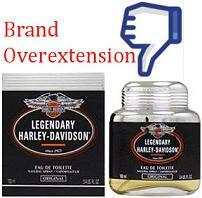 More products did not mean more revenue and overextending the brand meant a short-term focus.